Today’s guest blog post is brought to you by novelist, university professor and traveller JL Greger. I bet I’m not alone. I like to read and write about my pet peeves. One of my pet peeves is middle-aged women are seldom protagonists in thrillers and to a lesser extent mysteries. You don’t agree. Think about it. The women who populate mysteries and thrillers are often young action heroines, like Lara Croft or Superwoman, or old women, like Miss Jane Marple. Of course, many of the supporting characters, as victims or mothers, wives, and servants of the hero, are middle-aged women. But where are the articulate, fit women in theirs forties, fifties, and sixties in fiction? You know, the type of women that Helen Mirren, Judi Dench, Sigourney Weaver, or Alfre Woodard might play. The paucity of middle-aged women in lead roles in fiction is even more alarming, I think, when you consider the demography of populations in the U.S. and the United Kingdom. According to the census in the U.S. in 2000 and the census in the U.K. in 2011, about one-half of the females in these countries are between thirty and sixty-five years of age. We’re a sizable chunk of the population and deserve more attention. 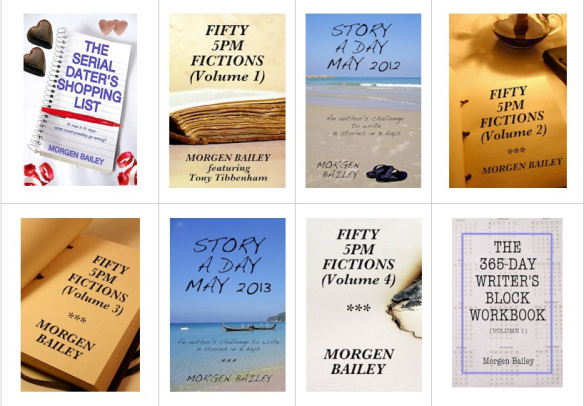 Authors should populate their novels with more smart, fit women in their forties and older. How I acted on my pet peeve? I can tell Rachel what the men see in Sara: a resourceful woman who helped to find a cure for a deadly flu epidemic in Coming Flu, consulted on public health problems in Bolivia in Ignore the Pain, and helped set up exchanges between scientists in the U.S. and Cuba in Malignancy. And that’s the only the work-related side of her life. She also had the guts to not flinch when she confronts a drug czar in the Albuquerque area with strong ties in Bolivia and other powerful, and sometimes ruthless, men. Pet peeves are defined as something you find offensive, but which others do not. It is often something trivial, such as Christmas decorations going up in stores in September, but these seemingly trivial behaviors irritate us because they remind of something important. For example, many women in the U.S. bristle if called “Miss and their first name” because they associate it with how servants were referred to in the South. I’m one of those women; I feel insulted when I’m talking business with a man and he calls me Miss Janet. Take time and assess your pet peeves. Most pet peeves aren’t as silly as they appear at first glance. Why should authors write about their pet peeves? Most of us can depict our pet peeves much more vividly than chance observations. We can create more lifelike characters when we show, rather than tell, about our characters’ warts and peccadillos. Most of can impart more feeling when we write about what we know and believe. Pet peeves subliminally reflect our beliefs and values. There is one other positive aspect to my pet peeve. I enjoy fantasizing how Helen Mirren would play Sara Almquist in a movie. Now it’s time for you to start writing about your pet peeves. As a professor at the University of Wisconsin-Madison, JL honed her story-telling skills as she lectured to bleary-eyed students at 8:30 in the morning. Students remember chemical reactions better when the instructor attaches stories to the processes. 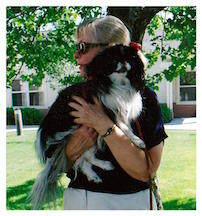 Now JL has two great passions – her Japanese Chin dog, Bug, and travel. She’s included both in her novels: Coming Flu, Murder: A New Way to Lose Weight, and Ignore the Pain. You can learn more about JL at her website: www.jlgreger.com and blog (JL Greger’s Bugs): www.jlgreger.com. Her Amazon author page is http://www.amazon.com/J.-L.-Greger/e/B008IFZSC4 (or http://www.amazon.co.uk/J.-L.-Greger/e/B008IFZSC4 for the UK). She also answers questions directed to: JLGreger@oaktreebooks.com. Now more about her novel Malignancy: Men disguised as police officers shoot at Sara Almquist twice in one day. Albuquerque police suspect Jim Mazzone, a drug czar who Sara has tangled with several times, will order more hits on Sara. 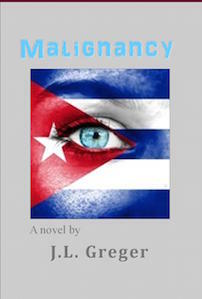 Thus when colleagues in the State Department invite Sara to arrange scientific exchanges between the U.S. and Cuba, she jumps at the chance to get out of town and to see the mysterious Xave Zack, who rescued her in Bolivia. Maybe, she should question their motives. Malignancy is available at Amazon (http://www.amazon.com/dp/1610091779) and Oak Tree Press: pressdept@oaktreebooks.com. and from this blog, guests who have written on gender in fiction include Robin Matchett. I would advise caution that a pet peeve does not become an author intrusion into the story. That itself could become somebody else’s pet peeve. Also, this might be of interest – the Bechdel test. Thank you, Captain. I’ve forwarded your comment to Ms Greger. Captain Black, I agree most of us aren’t good enough authors to write a whole book on a pet peeve, but adding bits of on pet peeves (perhaps better called our true selves) into novles can add humor and a sense of reality to characters. In my latest novel, The Piano Player, Rosie refuses to eat pancakes on the trail and spins off a short diatribe on them. People have assumed I hate pancakes and they are right! I love pancakes, but I don’t like beets unless they’re pickled. Maybe I should put that info and the story attached to it in my next novel or short story. Thank you for your comments / likes / pingback. I’ve passed them on to Ms Greger. Malignancy is available on Kindle now.